Parents of teething tots really need to sink their teeth into solutions to soothe their wee ones, in order to maintain any peace in the home! Since the popular Hyland’s homeopathic teething tablets were recalled this year, and plastics are increasingly unsafe, we were thrilled to see another great, natural product from Dress Me Up for babe’s to gnaw on for some much-needed relief. 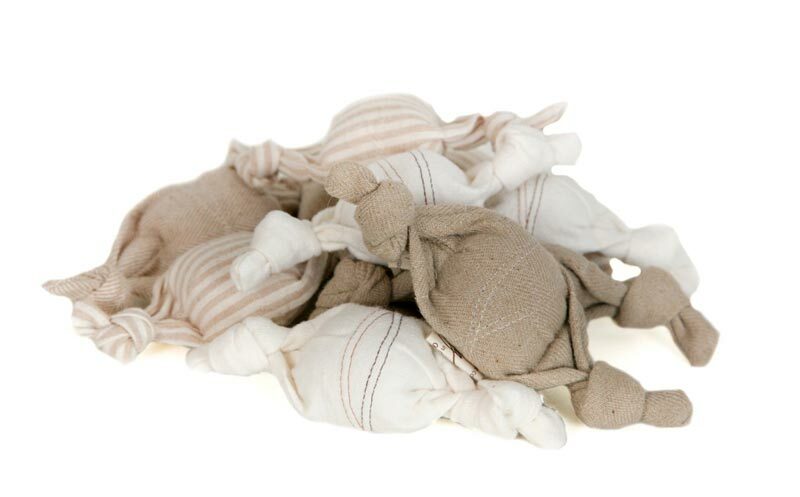 Already fans of their organic cotton teethers, their latest teething ‘bonbons’ are made with color grown organic cotton and naturally antibacterial Canadian lamb’s wool. The mother behind Dress Me Up discusses her excitement over color grown cotton, and how it adds “flair to organic cotton fabrics without the use of any dye,” and we think this innovative technique is worth reading about! In addition to the “Vanilla” bonbons we previously featured, the new collection contains Butterscotch, Caramel Stripe and Toffee teething bonbons. They sound delicious; and we’re certain they’ll provide sweet comfort for babies. Simply dip the ends in cooled, boiled water, leave the center stuffing dry, and toss them in the freezer until needed. They may also be machine wash and dried! 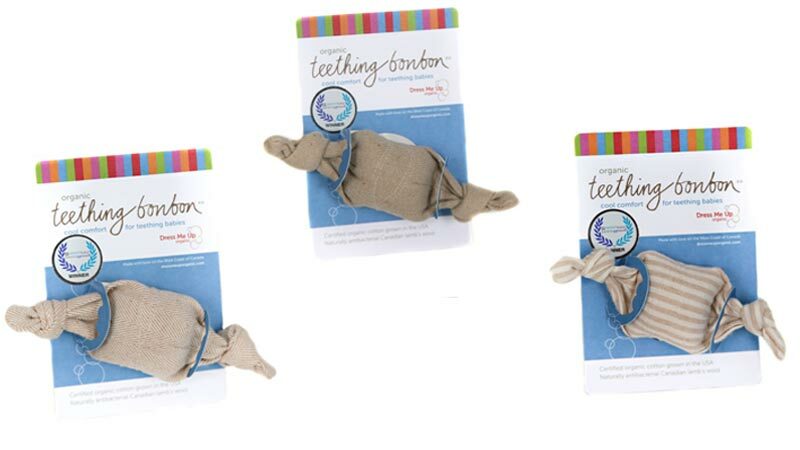 Parents of teething tots really need to sink their teeth into solutions to soothe their wee ones, in order to maintain any peace in the home! Since the popular Hyland's homeopathic teething tablets were recalled this year, and plastics are increasingly unsafe, we were thrilled to see another great, natural product from Dress Me Up for babe's to gnaw on for some much-needed relief. Already fans of their organic cotton teethers, their latest teething 'bonbons' are made with color grown organic cotton and naturally antibacterial Canadian lamb's wool. The mother behind Dress Me Up discusses her excitement over color grown cotton, and how it adds "flair to organic cotton fabrics without the use of any dye," and we think this innovative technique is worth reading about!